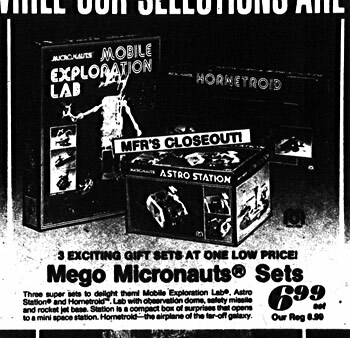 I've started an album over at Flickr Macrocrania called Non-circular Toys R Us ads 1977-1987 and it's full of old Toys R Us ads (or at least it will be soon). By "non-circular" I mean these aren't the full color Sunday circulars but instead they're the newsprint ads that were run in the regular pages of the newspaper during the week. 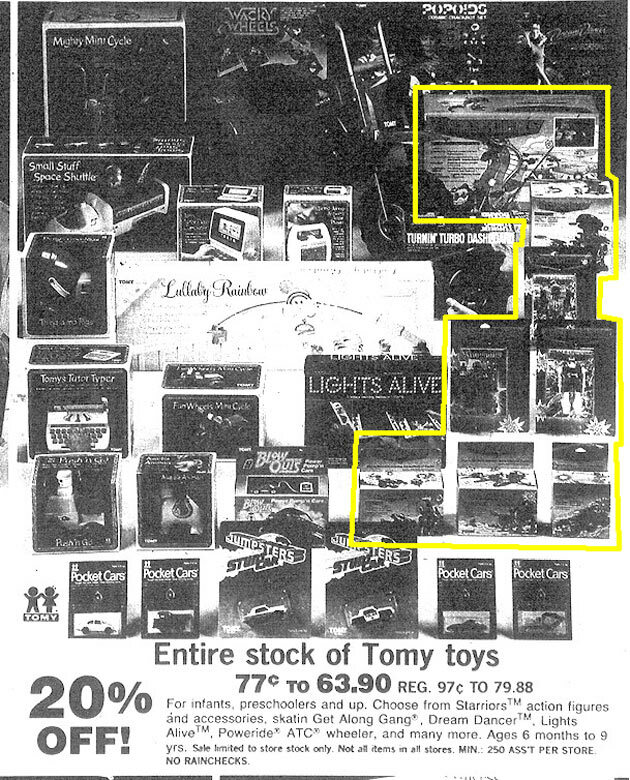 They're not all of the weekday ads TRU ever ran from 77 through 87 but just the ones I liked. Obviously there is strong pro-robot/sci-fi toy bias and I'm not including ads that were nothing but bikes, baby furniture or dolls. Some years are lacking in coverage so it's not all that robotty now but there's a lot coming. Like for example I haven't gotten up to posting anything from 1985 yet and that year is all sorts of robot fun. So I have a lot of ads to work through. In the meantime check out some cameos from '77 through 84 by famous robots from Shogun Warriors, Star Wars and maybe even a Zoid or two. I think fans of non-toy robot lines and just people who like Toys R Us might find this interesting. It's not complete yet but hopefully over the next few weeks I'll round out the rest of the missing years (and eventually do something similar for Lionel Playworld). It's the 32nd seal of the Roboplastic Apocalypse smacking you in the face like a kiss from a semi truck as we roll out to the Fort Lauderdale downtown library in this Gobackatron 1985thousand powered edition of the podcastalypse! Join the Nostrodomatron in a patriotic celebration of the nation's retail scene from the 80s as I crack open some fresh rolls of 1985, Washington D.C. style! Why do I love these old crappy scans of newspaper ads more than those full color department store catalogs on Flickr? Is a robosmorgasbord something you order at a scraplet cafeteria? Was Caldor a retail chain in the northeastern United States or somewhere on Eternia? 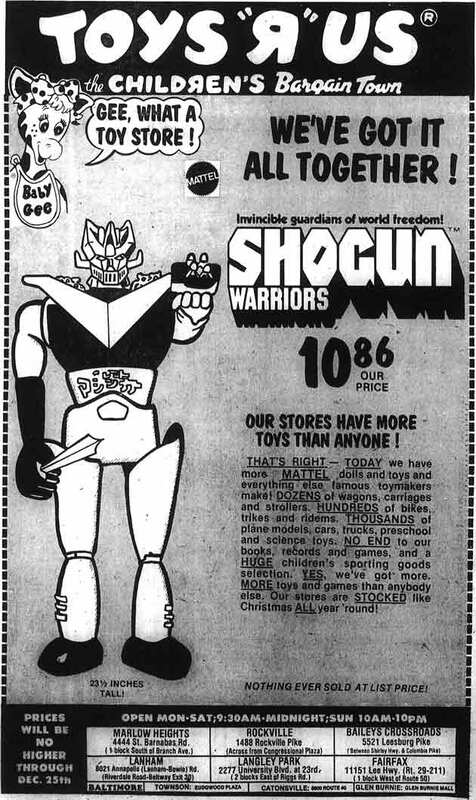 Is there anything more patriotic than getting erections over old toy robots ads from 1985 Washington D.C. newspapers? Find out in this FOUR STORE AND 25+ YEARS AGO edition of the podcastalypse! As the current presiding Nostrodomatron of this dimension I enjoy absolute dominion over space and time as long as that space is the second floor of the Fort Lauderdale library and the time is when I am looking at newspapers from 1985. Unfortunately my Gobackatron 1985thousand is only able to reveal blotchy monochrome glimpses into the world that was 26 years ago one newspaper page at a time. But like they say, it's the next best thing to being there and I'm cool with this being as close to real time travel as we'll ever get. I love doing it. However, if some smart guy does invent affordable time travel for ordinary schmukos like me and the day comes when the library is not the portal to the great Toy Robots Wars of the 1980s then I will not be sad that my golden age of staring at blotchy screens is over. In fact, if that day comes I have an idea that should make me just as rich as the guy who invented time travel, but with none of the hard work! There is an inherent implausibility in real time travel and I don't just mean because it's physically impossible. When I think about time travel I think about the practicality of visiting wonderful events in human history like the sermon on the mound or the signing of the Declaration of Independence or the day after Thanksgiving sale at Richway in 1984. While it seems nice, I seriously doubt the average schmucko who thinks, "Man if I just had a time machine and 50 bucks I'd make a killing by going back to 1985 and buying buttloads of Starriors!" really understands what he's wishing for. The big problem here and the crux of my moneymaking scheme is that 1985 money looks way different from today money. If you took fifty 2010 dollars back in time and tried to spend them you'd be jailed under suspicion of counterfeiting, or worse, people would just laugh at you and think you're an idiot from some magical fairy land where money is all the colors of the rainbow with ten different fonts and magnets, lasers, holograms and all the other stuff they have on dollar bills these days. That's where my idea comes in. What I'm thinking of is a business that does currency conversion for time travelers so they have the correct amount of ancient money from the appropriate year. And here's the kicker-inflation has so devalued currency that money from 2010 is half as valuable as it was in 1985! So in order to go back in time and make that killing on GoBots, time travellers would not only have to pay me twice as much today money, but they'd have to pay my transchronological currency conversion commission on top of that! Once time travel takes off I'll be rich not only IN a year, but in ANY year! CLEARANCE GETS THE DEADEYE OUT! Alas, this Starriors smorgasbord was all casseroled in with other Tomy toys and the individual prices can't be ascertained. But it's still a great show with figures from every Starriors size class except the transfer ring two packs. 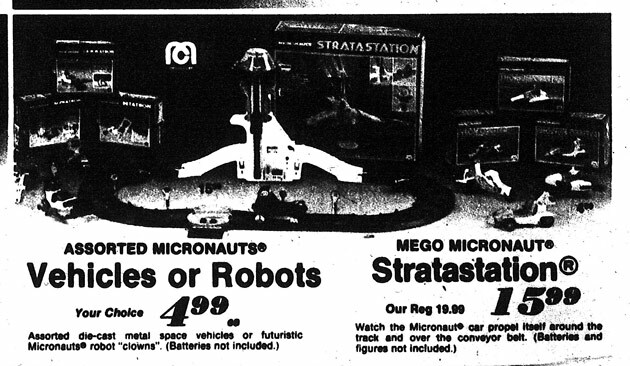 The GoBots camera makes its only ad appearance I've ever seen thanks to Bradlees! Quick, how many Deceptercons did it take to take a picture? Well it only took one GoBot if he had GoBots 110 film camera. It's kind of a shame they didn't give GoBots camera a more GoBotty name like Pic-Tor or Film Flam. Well at least they didn't go all Machine Robo and call it Camera Man. MONSTERS, WITCHES, COFFINS AND LIONS OH MY! Voltron was like robots vs. Halloween. The occult undertones of the original show are missing from its current incarnation. Seeing this Voltron smorgasbord makes me sad that a show and toyline like that will never happen again. Voltron bad guys were really demonic and each show was a robeast snuff film. It was great as a kid but I can understand why it may have driven some adults crazy. 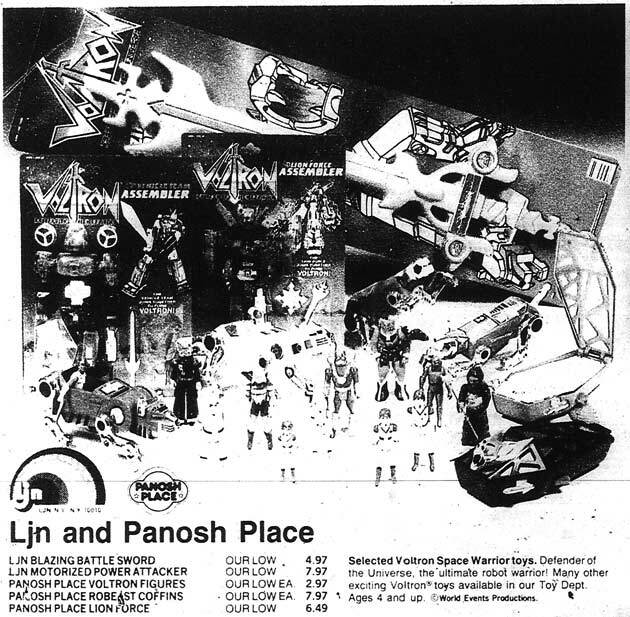 Have action figure coffins ever been marketed to children before or since Voltron? Can you imagine the uproar if Hasbro sold G.I. Joe body bag accessory packs? Oh man, Transformers 1985. That was the Christmas when living rooms across America looked like this ad. At least for a few minutes anyways. After a few minutes, living rooms across America looked like a bunch of snapped in half robots with broken windshields and sad children. ONLY THREE OTHERS SHARE THIS SECRET-OF FABULOUS SAVINGS! Was Caldor Skeletor's lesser known brother that went into retail? Whoever he was, it fills me with great joy to see the SDF-1 actually in an ad instead of the store just using a line art representation of it. 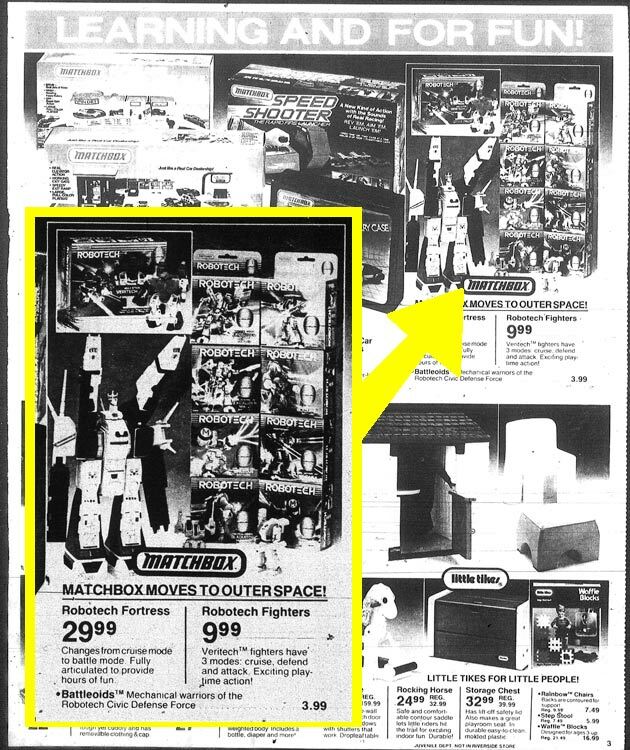 The blurb about Matchbox moving to outer space makes me think the Caldorian ad writer was unaware of that other Matchbox space robot, Voltron. 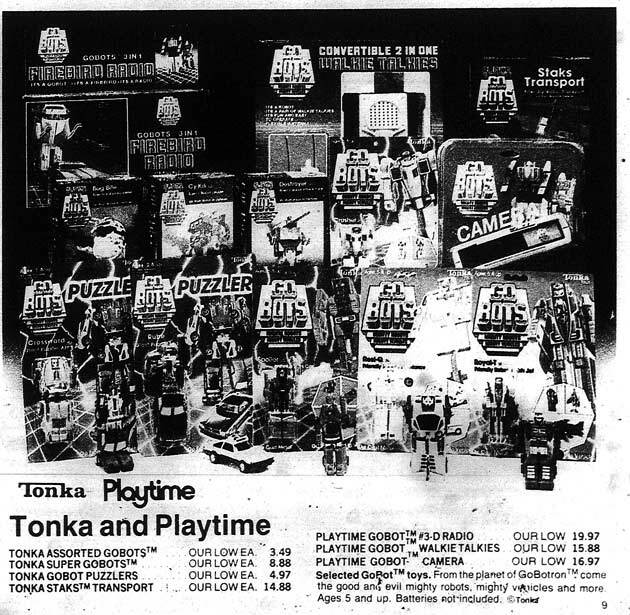 But maybe Voltron didn't stick in people's minds as a Matchbox product the way GoBots are synonymous with Tonka or Starriors with Tomy because there were so many different licensees of that line. 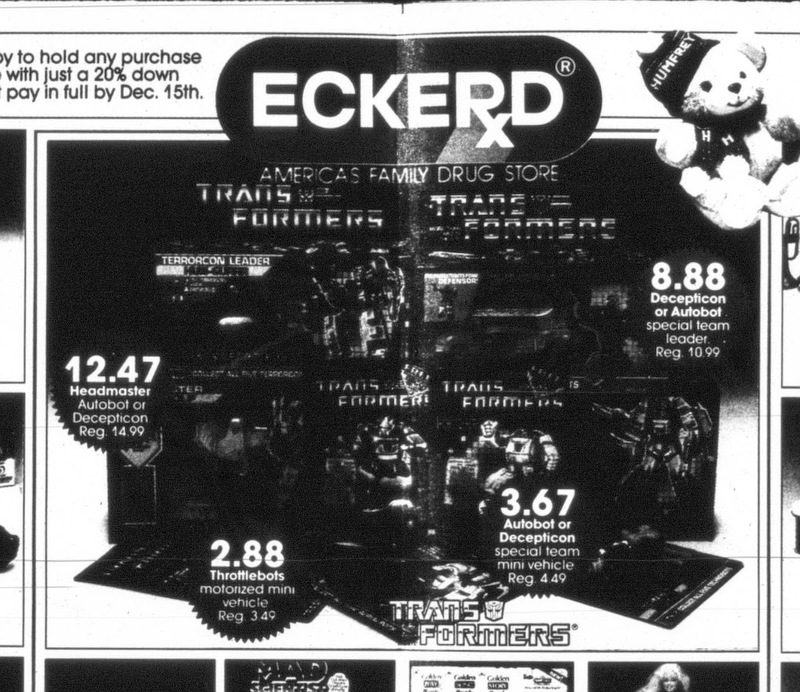 Eckerd's a little late to the robot party with this 1987 Transformer ad but any ad with Weirdwolf is okay by me. It's a strange little phenomenon but I've noticed that when a major toy fad hit, drug stores would heavily advertise knockoffs of the popular stuff during the height of popularity and then it would be a few years before they'd advertise the big name brands. 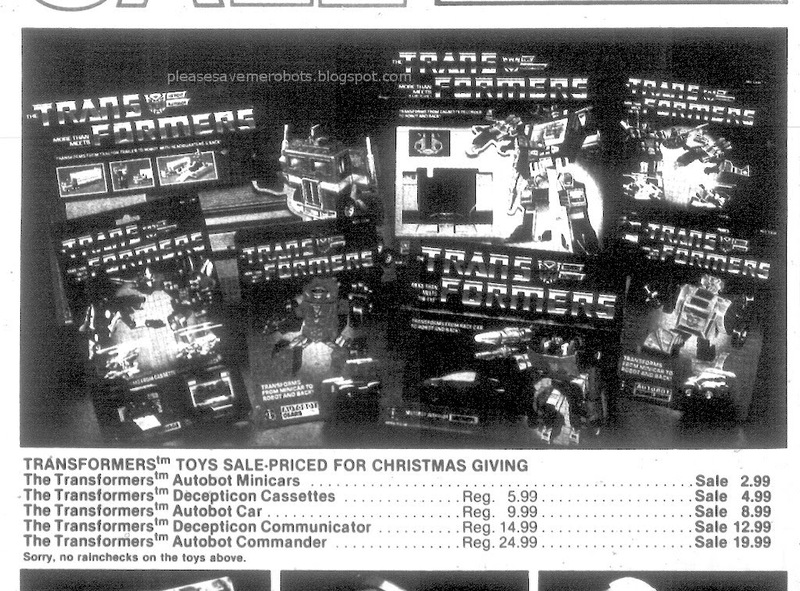 So in '84/'85 I see a lot of ads for Convertors and bootleg GoBots in drug store ads then I see legitimate Transformers years later. Overall what tended to happen is the big chains would advertise stuff when it was hot then the lesser chains and discounters would have it in their ads years later. By the time you saw a once popular toy in a drug store ad the party was over.